Coconut milk is different from coconut water (coconut juice), which you get when you open the coconut. You can read more about Coconut water. Coconut milk is easily available in cartons in liquid form or in powder form. But it makes sense to learn to make it yourself just in case you don't get it. You get coconut milk when you extract the milky juice by squeezing the inner white fleshy part of coconut. That is done by finely grating or grinding the coconut and extracting the juice using a little water. If you have a heavy duty mixer grinder, you can put the coconut pieces in it to grind it to paste. You can also use grated coconut to extract milk. Coconut milk looks like, well, dairy milk. But it has a coco-nutty flavor and fragrance and a wonderful taste. It can be used to make sweets, drinks, desserts, soups, curries in the same way as dairy milk. You need a muslin cloth or a fine mesh strainer to make coconut milk from fresh coconut. Break a coconut and take out the flesh. You may break it into smaller pieces or grate the coconut halves using a special grater available. Grind the fresh coconut pieces or the grated coconut using about 1/2 cup water. Put the paste in a muslin cloth, gather the ends of the cloth and squeeze to extract milk. This is thick milk. Keep it aside. Put the coconut residue again in the grinder with 1 cup water. Grind again and again extract the milk. This milk will be thinner that the first lot. Keep this aside in another cup too. You can extract some more milk with using one more cup of water and you will get the thinnest milk. Keep each extract separate. While cooking, the thinnest extract is added first to cook food in it and the thickest the last. That gives good consistency as well as lovely coconutty flavor. Depending on the dish you are making, you may use the thin or thick or both the coconut extracts. Get coconut milk by following the steps given above. For getting coconut cream, keep the thickest (the first extract) milk in the fridge or in a cool place for an hour or so. When it settles, remove the top creamy layer. This is coconut cream for you. This coconut cream contains more fat and is rich in coconut flavor too. 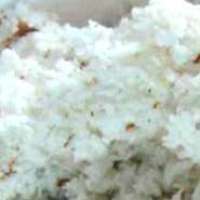 Coconut cream is used for making sweets and puddings. 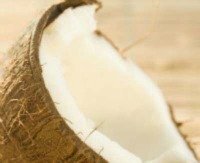 Want to Know more about how to get coconut juice? Coconut milk powder is made by evaporating/dehydrating the coconut milk. This coconut milk powder is available in packs. to get milk from this powder, just mix 1 tbsp powder with 1/2 cup hot/warm water and use this prepared coconut milk in your recipe. If you want thicker milk, use less water. How to make clarified butter-Ghee - How to make Desi Ghee - Making ghee from butter. How to roast eggplant - Roasting eggplant on gas / open flame. How to make yogurt - Homemade yogurt - Dahi - Curd.